This Spanish Colonial home had wonderful architectural features, but the interior felt dark, lacked cohesion and didn’t fit the spirit of a family that loves to entertain. Interior designer Heidi Feliz-Grimm helped give it a transitional style that feels harmonious with the original architecture. While doing so, she used materials and finishes that will stand up to the wear and tear of two young girls and lots of fabulous high heels. Getting rid of the dark feeling began with lights — fabulous lights. “The lighting was huge. I made the lighting choices before we even looked at furniture,” Feliz-Grimm says. “I chose unique fixtures and finishes that had impact and that were in keeping with the house.” For example, in the great room she replaced a heavy black iron multi-tiered chandelier that “looked like it belonged in a castle” with a sleek 10-light chandelier with a polished nickel finish. Next came a warm, creamy paint for the walls, which immediately brightened up the dark rooms. Because her client had mentioned she loved purple in their very first phone call, the designer incorporated it in potent pops. She re-covered two of the clients’ favorite existing chairs in a deep magenta and chose accent pillows that incorporated the hue. Fabric patterns also help tie the home together. “A lot of clients get scared when you say ‘floral’ because they think they will be very traditional and outdated,” Feliz-Grimm says. “But there are so many fresh options today — we went for abstract florals with a watercolor look.” You can see them here on the accent pillows and the drapes. While new lighting was the first thing the designer worked on for each room, these two beautiful chandeliers were existing, and she incorporated them. This photo was taken from the edge of the kitchen — the great room, dining room and kitchen are all open to one another. Feliz-Grimm used the same paint on the walls in all three rooms and a neutral color palette as the base for the furnishings. 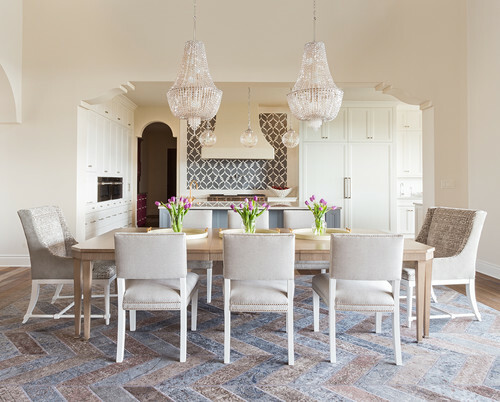 A special rug defines the dining room. It’s a chevron patchwork composed of antique Turkish wool rugs, shaved down to a flat-weave height, which makes it easier to keep clean. 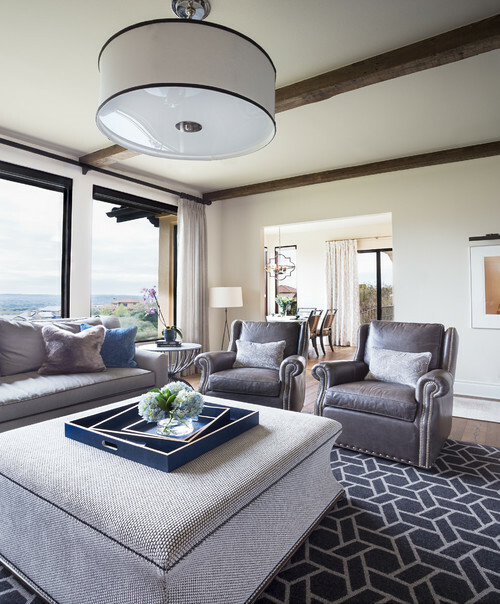 The designer was able to customize the color, and opted to dye the pieces in warm browns and grays to ground the room. Because the homeowners love to entertain, Feliz-Grimm found them a table that extends to 140 inches with leaves, as well as comfortable chairs. Host and hostess armchairs mix up the look and add texture. As you may have noticed in the previous photos, the backsplash behind the range plays a prominent role all the way across the three open rooms. Feliz-Grimm knew she wanted to do something really special there. She found a local company to custom-make the backsplash using jet-cut white and gray marble. “It’s a masterpiece that really catches the eye,” she says. 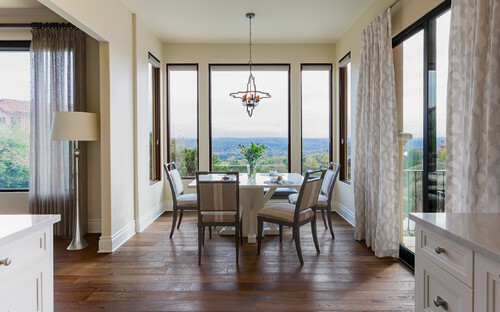 The glass and polished nickel light fixtures complement the large chandeliers over the dining table. 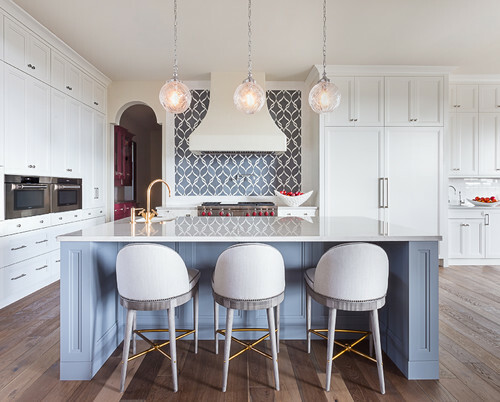 The designer chose a gray-blue for the island that plays off the backsplash, the blue on the pillows in the great room and the color palette in the adjacent media room. The designer chose a mix of metals for the kitchen. “Typically I don’t like to match everything; I like to keep some consistency but mix in others in bits,” she says. For example, she used chrome as the predominant metal in the kitchen but mixed in Cyprum — a blend of gold and copper that has a rose gold look — on the faucets. The countertops here are Luci Di Luna quartzite and the backsplash is white Thassos marble in a horizontal brick stack. The kitchen underwent the most extensive construction. It used to end just past the refrigerator, and this area was an outdoor room. The family wanted a casual breakfast nook, so this is a new addition. That provided an opportunity to open the kitchen to the media room, to the left, and create some great views out to the Texas Hill Country. To the right, sliding glass doors open up to a deck. This hallway leads from the kitchen to the garage entry. The cabinetry to the right provides a landing zone for keys and mail and is painted in a purple similar to the chairs in the great room. 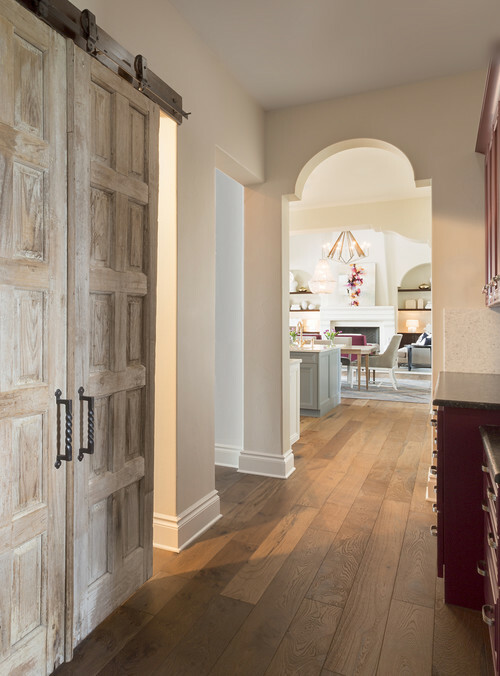 The new barn doors on the left add texture and a look that fits in with the Spanish Colonial style of the home. They lead to the pantry. In the media room, super comfy furniture makes this a favorite family gathering spot. To keep things durable, Feliz-Grimm chose fabrics that can stand up to a lot of abuse and are easy to clean, including leather and 100 percent polyester. To the right just out of view is the TV and a new set of blue built-ins. This drum light is another example of the thoughtful lighting choices that were made. The dark accents are actually leather, as are the straps that attach it to the chain. Feliz-Grimm added the ceiling beams to help tie the architecture to the rest of the home. She also redesigned the existing bar off the media room, an important feature for the parties this couple love to throw. “This was really his space,” Feliz-Grimm says — she planned the shelving and wine refrigerator around the number of bottles he gave her. The walls are covered in reclaimed beams. The floor is a glossy black hex tile, a shape common in Spanish Colonial architecture. The bar itself is Spicewood quartzite with a chiseled edge and leathered finish. The light fixture adds an aged industrial touch that complements the rustic walls. “In person, this bedroom is even bigger than it looks, so I really had to pay attention to scale,” Feliz-Grimm says. The high headboard, long bench, oversized tiered teardrop chandelier and chest nightstands create pleasing proportions. The room is calm and soothing and continues the neutral color palette with pops of purple. The shallow tufting on the bed gives it a more updated, streamlined look than traditional deep tufting would have. The designer also paid attention to the ceiling, choosing a striated wallpaper for between the beams to add some texture and reflect the light. Finally, the drapes feature another beautiful abstract floral print that resembles a watercolor painting and brings in more of the homeowner’s favorite color.